ArtZone 461 Gallery is pleased to announce two new exhibitions and plans for a continuing program schedule, following the anticipated success of our ongoing Kickstarter campaign. Heidi McDowell and Adam Cahoon have been assembling new works since late 2013 and have produced cohesive bodies of work, now ready for exhibition starting the evening of Saturday May 10th. The date coincides with an afternoon “Sidewalk Sale” organized by the Valencia Street Merchants Association (VCMA) and the final week to contribute to our campaign. Heidi McDowell’s paintings and prints are photo-based scenes recorded by her own smart phone or on-site sketches – as opposed to the professional photography of her husband Jon McNeal. 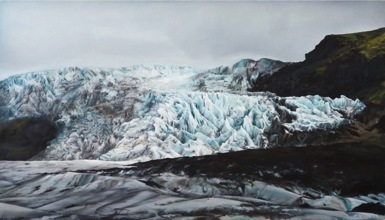 These works represent recent travel to places as familiar as Northern California and as exotic as Iceland. 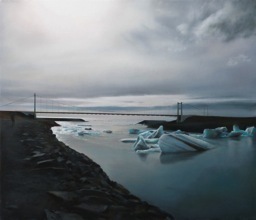 Her paintings present inherent dual identities: on one hand they capture an instant, the proverbial moment frozen in time; while on the other hand they offer not so much a challenge as much as an invitation to a varying, fluid, relevant and contemporary experience. Gallery Director Steven Lopez describes McDowell’s paintings among those that have “developed the farthest in the shortest time” since he began collecting in the late 1980s and becoming a (de Young) museum volunteer in 2000 and a Gallerist in 2002. Her vision travels beyond many contemporary approaches involving video, performance or technological advances such as 3-D printing. The work reveals an insightful, awesome presentation of the moment of joy one experiences for the first time in responding to an amazing visual revelation.